Equipment framework is 63” wide x 77” deep x 192” tall. Main framework constructed from 4” square x ¼” wall structural tube, all welds continuous. Unit features intrinsically safe, all pneumatic controls for hazardous location service. 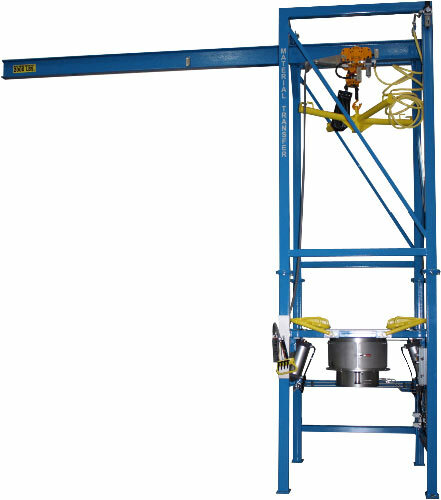 1-ton Harrington air powered chain hoist with motorized trolley and nylon energy chain package. Unit features a custom monorail to allow bag pick-up in a more easily accessible area. Stainless steel/UHMW Flo-Lock™ discharge gate quickly halts material flow to allow bag to be retied and removed. Stainless steel Seal Master™ bag spout access chamber with “gull wing” doors allows optimal operator access to bulk bag discharge spout. Stainless steel Sure-Seal™ system pneumatically clamps bag discharge spout against transition inlet for dust-tight material discharge.